1. Read the title and labels on the graph as well as the instructions. 2. Analyse the information in the graph, looking at the overall trend(s). 4. Choose the most important details that will support your statement(s) or main trend(s). 5. Think about how to restate the main trend(s) in the graph using different words. - Content: is the information accurate and detailed enough? Do the details support the topic sentences? Note: the number of body paragraphs depends on the number of main ideas/major trend in the graph. There are two major trends. The number of tertiary students increased dramatically. The sales reached a peak in June. The amount/number/figure stood/stayed at 12,000. The percentage stood/stayed at 30%. The difference between the two groups of data is significant. Water use has increased by 35 times in the past 30 years. The prices are three times higher than they were a year ago. Young people from broken families were 2.5 times more likely to consider suicide. In 1993, 60% of people in that city had bicycles, compared with 10% in 1970. The percentage of the elderly population has risen from 30% to 60% in the past 30 years. The figure for the young population fell from 60% to 30% between 1990 and 2010. Over the last 300 hundred years, world population has increased sevenfold. In 2000, only 19% of the population was elderly people. Young people made up 65% of the total population in 2000. Older people accounted for 19% of the population in 2000. The elderly group will increase from 19% in 2000 to 36% in 2050. The elderly population will increase by three times by 2050. This percentage is projected to decrease to 19% by 2050. Some graphs are static, i.e. they show data at one point in time. Many graphs, however, illustrate changes in trends over several periods. Trends are tendencies, or movements in a particular direction. Describing these accurately requires specialized vocabulary. In order to write well and achieve a high mark for a graph description task, you need to use a variety of vocabulary items and not simply repeat the same nouns or verbs such as ‘increase’ or ‘decrease’. In conclusion/in summary, there is a correlation between the two graphs. To decide which tense(s) to use for describing a graph, you need to find out whether there is a time element to the graph. Is it the past, the present or the future? Don’t forget to look at the title of the graph to see what time it relates to. If no time is given, you can presume that the data are current (see the graph in Task 1). if there is a connection between the past and the present, then use the present perfect. if there is a connection between two actions both happening in the past, with one before the other, then use the past perfect. However, we always use the present tense for the first sentence in the introduction to define the chart/graph. Indicate whether these statements regarding the bar graph are true or false. 1. 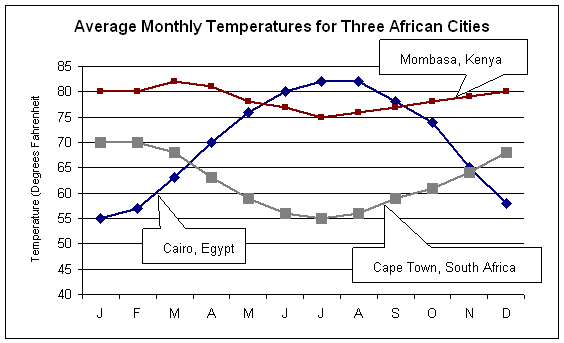 The temperature in Cairo peaks during the month of July.